I like music — I have a decent music collection (digital & vinyl), but I’ve never been to a concert. Well, I did see & hear Bonnie Raitt and many others at the New Orleans Jazz Fest in 2004. Though I’ve lived in St Louis for 28+ years, I haven’t participated in the local music scene other than hearing the Bosman Twins in 1990 and Kim Massie at a few events. So when I received the new book St Louis Sound: An Illustrated Timeline I wasn’t sure I’d find anything of interest to write about. Boy was I wrong. From the French fiddlers of the fur trading days to the rock and hip hop icons of the present millennium, St. Louis has been a town rich in musical history. Though it has rarely been cited as a center of any scene, any area that has been home to Chuck Berry, Miles Davis, Ike & Tina Turner, Grant Green, Pavlov’s Dog, Uncle Tupelo, Nelly, and Pokey LaFarge has clearly deserved more attention. 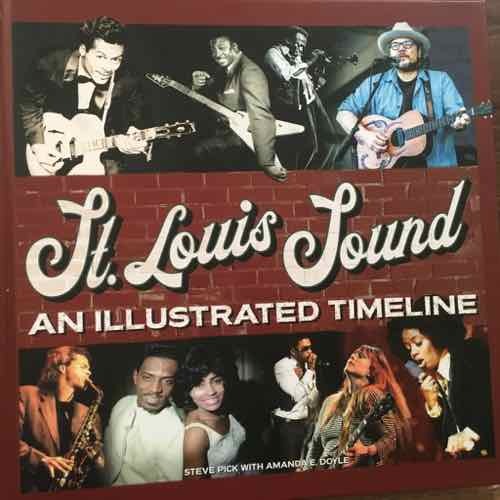 This book tells the story of music in St. Louis, from the symphonic to the singer/songwriter, from the radio stations that propelled it to the fanzines that documented it, from the musicians who left here for greater fame to those who stayed and made this town more vibrant. This is the first time that all the tributaries of the great St. Louis river of song have been covered in one place; classical, jazz, blues, r&b, rock’n’roll, country, hip hop, and more. I’ve learned so much flipping through the photo-filled pages. For example, I’m a huge fan of Missy Elliott’s 1997 song The Rain (Supa Dupa Fly). If you don’t know it you can see the creative video here. Anyway, I’d long thought the chorus included a sample of an older song, but I’d never researched it. Then on the page after the venue Blueberry Hill was the entry on Kinloch-native Ann Peebles. It mentions she co-wrote her 1973 hit “I can’t stand the rain.” To Wikipedia and YouTube I went. One comment on YouTube nailed it — that she sounds like a female version of Al Green. A very high compliment! The book mentions she worked with Green’s producer, Willie Mitchell. Online I learned about a 1978 disco cover by Eruption and a 1984 cover by the Tina Turner on her Private Dancer album. Peebles had previously worked with Oliver Sain (1932-2003), best known for Soul Serenade (YouTube). I also learned Sain had a recording studio in the 1905 building at 4521 Natural Bridge. Ann Peebles retired following a stroke. I can’t think of another book that has brought me so many hours of joy as I combed through the intense level of detail, looking up names & songs on YouTube & Wikipedia, Googling venues to get addresses to look up. If you’re into St. Louis and/or its music this book should interest you. Released today, it’s available via Left Bank Books, Amazon, etc. 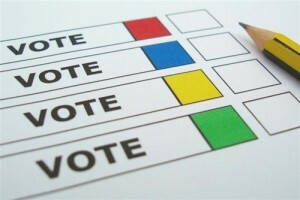 Q: Agree or disagree: Nothing will increase voter turnout in St. Louis’ local elections, it just is what it is. To those who agreed with the poll’s statement — wake up! There’s lots of ways to increase voter participation. First, we must step back and determine why exactly that eligible voters don’t bother for races other than the national election every four years. One group is taking a step. 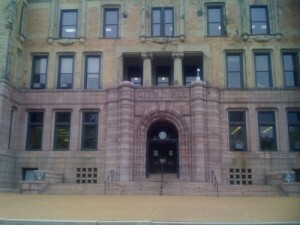 A group called Show Me Integrity is launching a petition drive to gather about 20,000 signatures to make a change to the St. Louis charter instituting “approval voting” in a nonpartisan primary for mayor, aldermen and other city offices. Under that system, recently adopted in Fargo, N.D., voters can cast a vote for as many candidates as they want. The top two vote-winners would advance to a runoff that would replace the general election. St. Louis is among only a handful of major cities that still uses a partisan system allowing a plurality of voters through a party primary and general election to choose leaders. “That’s increasingly rare,” said Rob Richie, executive director of FairVote, a Washington-based organization that advocates for election reform. This is new to me, so I’m not yet sure how I feel about it. That said, I welcome their action and the civic discussions it’ll cause. I’ve been a longtime supporter of ranked-choice voting, aka instant runoff voting. Ranked choice voting (RCV) makes democracy more fair and functional. It works in a variety of contexts. It is a simple change that can have a big impact. See FairVote’s look at Open Ticket Voting, Cumulative Voting, Single-Vote Method & “Limited Voting”, and Districts Plus here. Other ideas include switching to non-partisan elections, thus eliminating separate partisan primary that’s the real election — the general election a month later just a costly formal confirmation of the Democratic primary. We need to find the root problem(s) that cause voter turnout through much of the region to be low. Then we need to consider adopting solutions to solve those problems — without causing new problems. It is possible that a disability is the cause of a handicap. For example, if a person has a disability that prevents them from being able to move their legs, it may result in a handicap in driving. In the video from the above article they list three unacceptable words: handicapped, cripple, special. I agree. Whenever I hear or read handicapped I equate it with the word cripple. The c-word is so bad South Park’s Eric Cartman uses it. A 2013 photo of a Porsche squeezed into the loading space between two accessible parking spots. This is just as bad because some of us need this aisle to open our doors fully, others need it for their ramp to enter/exit their vehicle. Police said the Amazon delivery driver, identified as Jaylen Walker, pulled into a handicap parking space near the front of the store and was talking to another Amazon driver when the suspect pulled up. The suspect, identified as Larry Thomlison, was apparently upset about the Amazon truck being parked in the disabled space. Thomlison took out his cellphone to document the Amazon truck in the handicap space. He posted a picture of the illegally parked delivery truck to his Facebook page. Wilkison said Thomlison did have a handicap placard in his car. St. Chares County Prosecutor Tim Lohmar said Thomlison waited for Walker to come out of the Target and confronted him. It’s unclear if Thomlison was recording the confrontation. Walker pushed Thomlison aside, at which point Thomlison punched the Amazon driver in the face. A struggle ensued and both men fell to the ground. As Walker got to his feet, he noticed a pistol in Thomlison’s waistband. Walker began to back away and then turned to run. Thomlison then pulled the gun from his waistband and shot the 21-year-old delivery driver in the back. As frustrating as it has been for me the last decade since my stroke, no one parking in a reserved accessible spot deserves to be shot. Unfortunately, enforcement is often left up to those of us who just want to park and go about our business. I can still remember the very first time I reported vehicles parked in disabled/accessible parking without state-issued plates/placard. I was only 8 or 9 and would bike to the then-new branch library near my house. If a car was illegally parked I’d jot down the description & plate number and go inside and insist they announce over the loud speaker that the owner move their vehicle. That was in the mid to late 1970s. Yes, building codes required accessible parking, curb ramps, etc prior to the Americans with Disabilities Act of 1990. Another very important thing to remember is not everyone with proper plates/placard appears obviously disabled. When I park and walk into a business it’s very obvious I’m disabled: cane, awkward gate, visible leg brace during shorts weather, etc. 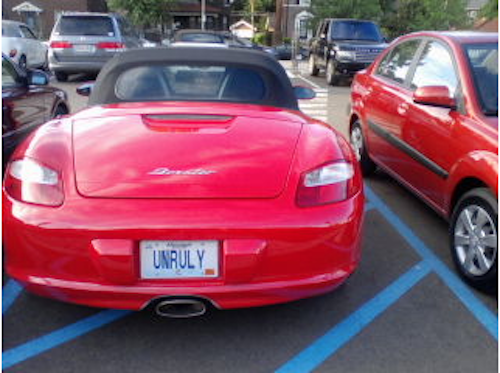 However, others might have a heart condition or some other reason for their doctor to authorize a disabled plate/placard. In the St. Charles example, numerous lives will be disrupted because one able-bodied person decided it was ok to park in an accessible spot and another brought a lethal weapon to a confrontation. Both were unnecessary. Voter turnout in last week’s St. Louis partisan primary was low, ranging from 10.09% (5th Ward) to 28.02% (8th Ward) — source. St. Louis voter participation is always the lowest in the region. Among the eight counties in the St. Louis region, voter turnout tends to be highest in Monroe and St. Charles counties and is often lowest in the city of St. Louis and in St. Clair County. In the 2018 mid-term election, voter turnout among registered voters was highest in St. Charles (64.1 percent), St. Louis (60.8 percent), and in Monroe counties (60.5 percent) and lowest in St. Clair County and in the city of St. Louis (both 51.9 percent). During the 2016 presidential election, voter turnout was highest in Monroe County (78.4 percent) and lowest in in city of St. Louis (59.2 percent). — source. Today’s poll is about voter turnout. This poll will close at 8pm, come back Wednesday for the results and my thoughts on the topic. Tuesday’s partisan primary is over, next up the candidates from all the parties will face off in the April 2nd general election. Oh right, the Democratic primary is THE election. Next month a few of us will vote again, for the school board. 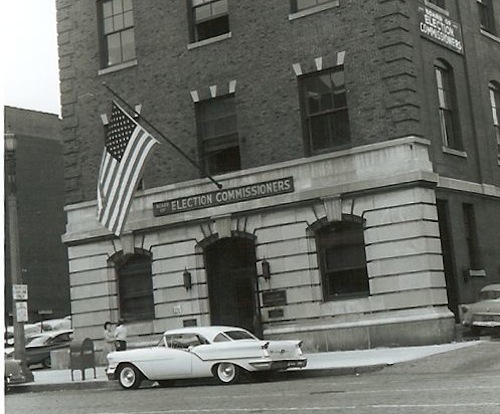 If St louis elected nonpartisan officials we could eliminate one of two low-turnout elections held one month apart. Only three of the 15 seats on Tuesday were open seats, one was vacant and two incumbents decided not to seek an additional term. Only 17% of registered voters participated in the 5-way race for an open seat. Winner Jesse Todd received 38.84% of the vote. Ald. Terry Kennedy decided not to run again. 21.2% of those registered voted in the 5-way race. Attorney Bret Narayan won a majority of the votes with 55.54% selecting him. Former Ald. Tom Bauer came in 2nd with 16.6%. Whew, thankful he didn’t win. Two independent candidates have filed to run in April, a good plan in case Bauer had won the Democratic nomination. Ald. Scott Ogilvie didn’t run for re-election. Twenty percent of registered voters cast ballots in this 3-way race. Shameem Hubbard, wife of Rodney Hubbard, won with only 36.73% of the votes. Ald. Frank Williamson resigned after accepting a job in the Treasurer’s office. Christine Ingrassia survived the 4-way race with 44.26%, Debra Carnahan came in 2nd place with 27.84%. Turnout was 25.5%. Annie Rice was re-elected in the 2-way race with nearly seventky percent of the vote, turnout was relatively high: 28%. Joe Vollmer easily defeated the challenger, with over sixty percent of the votes. Turnout was 21.8%. Larry Arnowitz crushed his two challengers with 74.33%. Voter turnout was 21.9%. Carol Howard will have another term with 52.01% to her challenger’s 47.99%. Turnout was 20.6%. Thomas Oldenburg was unchallenged, turnout was 21.9%. Jeffrey Boyd was re-elected with over sixty percent of the votes, turnout was 16.2%. Heather Navarro wasn’t challenged, voter turnout was 19%. Lewis Reed was re-elected to a fourth term in the 4-way race with only 35.63% of the vote, citywide turnout this election was 17.83%. State Sen. Jamilah Nasheed came in 2nd with 31.6%, Ald. Megan Green 3rd with 31.19%, and Jimmie Mathews a very distant 4th with 1.57%. Over 200 people who voted in the democratic primary didn’t vote in this race. Post-Dispatch: “Lewis Reed won only five of the city’s 28 wards in Tuesday’s Democratic primary race for president of the city’s Board of Aldermen, but those victories came in historically high voting areas, providing enough support for him to prevail in a close battle with two opponents. By comparison, state Sen. Jamilah Nasheed won 13 wards, dominating the north side. Alderman Megan Ellyia Green won 10, with a strong showing in the central part of the city including her Tower Grove South neighborhood. Only two races, with three or more candidates, did the winner get a plurality of the votes cast. Four races the winner didn’t get more than 50%. In many places these races would have a runoff election between the top two. Still, in other places they’d have an instant runoff, also known as Ranked-Choice Voting. The ultimate winner might be the same, or not. It just depends on how voters ranked the candidates after their 1st choice. It eliminates the perception of the third candidate as a spoiler. RCV would be especially helpful in highly crowded races, like the 2020 Democratic presidential primary.